A Quick Update Before My Site Goes Down Again. I’m going to update my site – or at least try – before it goes down again. My poor site spent 14 hours in some sorry state of purgatorylimbo yesterday and then after about 87 million emails back and forth with Mochahost, it went back up. And then it went back down again. So, there are no promises here, you guys. The one thing I can tell you is that I have suddenly found myself with more time on my hands than I was expecting, so, while I could take this time while all three of my children are in school to lie on my couch and eat cookies and watch talk shows, I am going to clean out my garage and fold laundry and spend 35 minutes on the elliptical and teach myself how to switch hosts. Yes. I am. Even she has faith in me that I can do this on my own. I used to be very “Becca! Help me! I broke something! Fix it for me!” and because she’s amazing and wonderful and talented as hell, she does it for me. But now I’m all, I actually have the time and I fancy myself a pretty capable person and a quick learner and now it’s time to get my act together and not rely on poor Becca to fix my problems, but to help me help myself. So, today it’s moving my blog from one host to another, once I do all my twitter polling and research and actually decide which host to go with. Tomorrow…it’s on to teaching myself html! Anyhoo. Other than having to deal with a 4th grader who thinks she needs to have a cell phone and having to sit in a sushi restaurant with friends with my face in my iphone cursing about my hosting problems, things are good. No, really, she thinks she needs a cell phone. For what exactly? I mean, my child isÂ chauffeured to school each morning andÂ chauffeured to her after-school activity and thenÂ chauffeured home again where she can talk to her friend via facetime or facebook or skype, or, you know, the actual telephone. Kids these days. MAN. I explained to Miss Emily about my first portable phone, which was not exactly a cell phone as it was mounted into my car and it was only for absolute emergencies. “Now, Ali, I don’t want you to even pick up this car phone unless you are amidst an 8-car-pileup. Mmmmmkay?” Also, it was the size of a small child. So, no cell phone. But it’s really all I hear about right now. ALL. Josh scored his first hockey league goal ever. This is huge for us. Josh likes hockey, but he has never really LIKED hockey. Last year we were in Atlanta, where, surprise! the kids do not play ice hockey. So, he missed a year of skating and a year of puck handling and a year of being on the ice. So, when we came back to Toronto, we threw him back into hockey and he was all, but I really just want to play baseball. Unfortunately for my son, he lives in the wrong climate for baseball. In Atlanta, they can play year-round. In Toronto, it’s cold by September, and in April it’s still snowing. (Yes. It is. It snowed LAST NIGHT) So, his team lost their last game which meant they only had one more game…theÂ consolationÂ game where the losers play each other. And Josh was all, finally, I am done with this. Only he scored. Finally. He went to the net. He shot. He scored. He rejoiced. And now he’s signed up for hockey camp and he’s ridiculously excited about it and he hasn’t stopped talking about hockey since yesterday. It’s amazing what one goal can do for a child. Uhhhh…..there’s lots of hockey(ice and roller) in Atlanta. As there is down here in Central Florida. Oh well, hope he has fun at camp! I’d like to go to one myself. Yes, they have adult hockey camps. I wouldn’t say LOTS in Atlanta. there were a few, and they were all abou an hour drive from us and at really inconvenient times. It’s different in Toronto…there are thousands of places and times he could play. In atlanta it was inconvenient. Baseball was much more prevalent and much easier for us. I’m so happy for his goal! A child in 4th grade told me last week that her mom was getting her a cell phone for a good report card. Really? Seriously? For what? I heard last week that there are serious concerns for childrens’ growth and development and the use of cell phones. However, I would bet that all her friends have one. Doesn’t mean that she should, so good luck with that. The joys of first world parenting…. I’m going to get flamed by the other parents for this, I usually am. My kids get a cellphone at age *8*. And no, it’s not because I feel like they’re entiled, or special, or whatnot. it’s because at age 8 I feel they’re mature enough to handle them. it’s also because at 8 schools start doing more and more off-campus field-trips and such and there’s nothing more reassuring than lo-jacking your kids before field trips. Thanks to cheap android phones and Google latitude, I can pull up on a map where each of my kids’ cellphones are at any point in the day, on any web browser or my phone. Totes worth it. I’ve busted my teenager with being able to ask “where have you been” already knowing the answer. And, man. Graham’s been asking about a cell phone too – one of his friends has one – but hell to the no. He doesn’t need one. 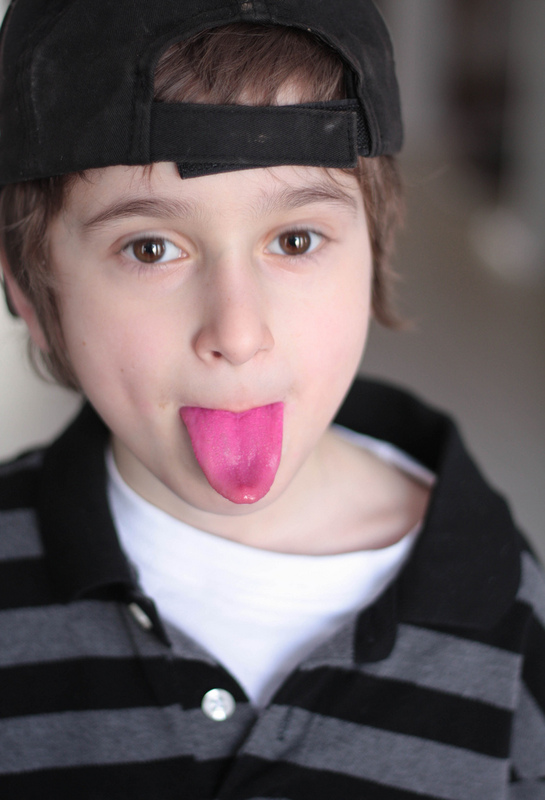 That is one impressive pink tongue!